A border confrontation between Uzbekistan and Kyrgyzstan is creating hardship for citizens of both countries in remote villages along the undelimited frontier, and, in at least one case, is stoking a food shortage. Authorities in the Uzbek capital Tashkent have said little publicly about the situation. But sources inside Uzbekistan say that silence should not be confused for passivity. Other observers add that some high-ranking security officials are purportedly pushing for armed action, itching for a chance to gain retribution for what they see as Kyrgyz persecution of ethnic Uzbeks going back to the Osh events of June 2010. The border standoff in the ethnically diverse Ferghana Valley began January 5, when hundreds of residents of Sokh – a densely populated valley that belongs to Uzbekistan, is mostly populated by ethnic Tajiks, and is entirely surrounded by Kyrgyzstan’s Batken Province – attacked Kyrgyz border guards as they were installing electricity poles on contested territory. The next day Sokh residents descended upon a Kyrgyz village, where they burnt cars, destroyed property and took several dozen Kyrgyz hostage. The hostages were quickly released. 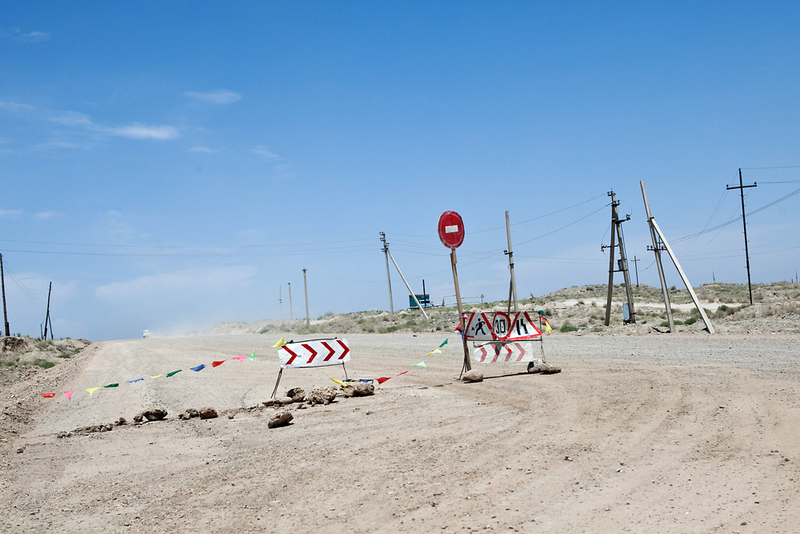 But since January 7, Kyrgyz villagers have blocked the main road linking the Sokh exclave to Uzbekistan proper. Apparently in retaliation, Uzbekistan has closed its border with Kyrgyzstan and blocked rail shipments. In one tiny Kyrgyz enclave surrounded by Uzbekistan’s Andijan Region, 300 families are running out of food, according to January 23 media reports. Uzbek leaders have also threatened to stop gas shipments to southern Kyrgyzstan. Kyrgyz villages that are in Kyrgyzstan proper, but depend on road connections through Sokh, have also been cut off and are running short of essential supplies. Kyrgyz officials say they will allow Uzbek humanitarian convoys to pass, local media reported on January 23. But as of late in the day, Kyrgyz villagers continued to block the road, said Bakyt Muratov, a local village council deputy. “I have not seen any Uzbek vehicles pass through since January 7. The road is still blocked by our people,” he told EurasiaNet.org. A representative in the Sokh mayor’s office insisted on January 21 there were no food shortages, but would not discuss the situation. The Ferghana Valley is a checkerboard of enclaves, exclaves and undelimited borders dating from the Communist era, when all three countries – Kyrgyzstan, Tajikistan and Uzbekistan – were part of the Soviet Union. Since independence in 1991, the three countries have been unable to agree on frontiers, especially in densely populated areas, such as Sokh. This latest bout of tension is connected to population growth and poverty in the Ferghana Valley: arable land and water are limited, and competition among residents for scare natural resources is increasing. Throughout the standoff, one mystery has been how Uzbekistan, which has a much larger military than Kyrgyzstan, might respond, if conditions deteriorate for Uzbekistani nationals in Sokh. Though both sides have pledged to negotiate, there has been little visible progress toward a border agreement. Kyrgyz officials complained earlier this week that their messages were going unanswered. Though Uzbekistan has paid $56,000 in compensation for damage to Kyrgyz property, according to a January 19 report by Vechernii Bishkek, one local mediator says Kyrgyz villagers are unwilling to lift their blockade of Sokh. “In addition to material, they also are demanding compensation for moral damages from the attack by Uzbek citizens,” said Robert Avazbekov, the head of the Batken-branch of the Foundation for Tolerance International, a local non-governmental organization that specializes in conflict prevention. “They are not afraid of potential Uzbek military intervention and they are prepared to stand until the end,” Avazbekov added. State-controlled Uzbek media outlets have remained largely silent. But a Ferghana Valley-based source close to Uzbekistan’s security services, the SNB, says the blockade is dividing senior security officials. Some high-ranking generals, mainly representing the Committee on Border Protection, have reportedly called for swift military action to break the blockade around Sokh, said the source. According to a senior Uzbek diplomat who spoke with EurasiaNet.org on condition of anonymity according to protocol, President Islam Karimov strongly opposes military action, fearing that a regional border war would destabilize the whole region. The fact that Kyrgyzstan is a member of the CSTO, the Russia-led security alliance that Uzbekistan recently abandoned, plays a considerable role in the thinking of Karimov and his interventionist-shy allies, according to the diplomat. CSTO members are treaty-bound to aid Kyrgyzstan in the case of external aggression. The fact that Karimov, who often ignores requests from his neighbors, quickly ordered local officials to negotiate with the Kyrgyz underscores the gravity of the situation. “Karimov doesn’t like to be perceived as weak, so his order to negotiate with the Kyrgyz side reflects his deep concern,” said a Tashkent-based journalist who has covered the country’s foreign relations. Some outside observers believe Uzbek military officers from both the Defense Ministry and the border services – especially those with families in the Ferghana Valley – are eager to engage their counterparts across the border in Kyrgyzstan, whom they blame for ethnic violence in June 2010 that left over 400, mostly minority Uzbeks, dead. “The Sokh incident is actually a continuation of a long-running feud between the Uzbek military and the Kyrgyz [military],” Shahida Tulaganova, an Uzbek journalist based in the United Kingdom, told EurasiaNet. “And they [the Uzbek side] have been looking for opportunities to take revenge." In his effort to calm trigger-happy generals, Karimov has resorted to a familiar crisis-management tactic: he has blamed faceless outsiders for stirring up trouble, without providing evidence. “There are some external forces that are eager to foment tensions among [the five Central Asian republics] so these countries will be caught up in turmoil, unable to develop and to attract investment,” Karimov said in a speech broadcast January 19 on state television. Many believe he was referring to Russia. In the same address, Karimov ruled out turning to outside mediators. Earlier, in a January 11 speech in honor of the Uzbek armed forces, Karimov appeared eager to mollify officers, pledging a salary increase and better living conditions for military personnel.